Konstantin Egorovich Makovsky painted this patriotic canvas for six years. This is the largest easel canvas in Russia. In addition to the main character Minin, more than a hundred portrait characters are depicted on it. 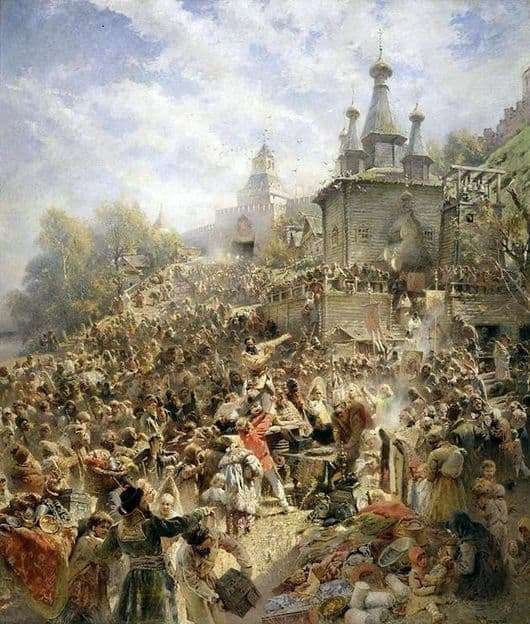 Inspired by the author to create this masterpiece Repin, who in 1891 showed the light of his creation under the name “The Cossacks write a letter to the Turkish Sultan.” Delight was insane, then it was Makovsky who decided to paint the most huge historical canvas. To do this, he went to Nizhny Novgorod, where he spent more than one day in dusty archives. Historians have confirmed that the collections were held near the church of St. Nicholas. On this day, the usual trading took place, it was then that Minin decided to address the people of Nizhny Novgorod with a word. The artist reliably conveyed the architecture of the time, the characteristic towers and wooden peaks. He made sketches of people from the window of the living room on Rozhdestvenskaya Street. He watched for hours traders and other people of different classes. The author sought out the most interesting faces and tried to convey the mood, and even the character of a person. At the same time, the artist met with Karelin A. O., who tenderly collects household items of the old time. He collects outfits and various characteristic little things. It was necessary to transfer the real picture of the offerings, all the caskets and caskets were copied from genuine products. The picture is based on historical facts that occurred in 1611. The painting of 40 square meters was first shown in Nizhny Novgorod, it was 1896. The colors of the early morning of an autumn day are faithfully conveyed on the canvas. Zemsky warden Minin calls on the people to help the Moscow State, people carry their savings and lay them on an improvised platform. Until now, there are a lot of fees and comments around the canvas. Someone praises the author, but there are those who criticize and point out shortcomings.